In this post, asp.net app development team is sharing key changes in asp.net 5 and MVC 6 framework. This is the first time when you can run asp.net 5 application on Linux and OSX. In other words, your asp.net 5 apps can perform on OSX, Windows, and Linux. This change will benefit all developers and designers and empower them to build apps using asp.net 5 with their favorite development environment, like Webstorm and sublime text while working with asp.net applications without any requirement of Visual studio. If you have spent thousands of hours of your life building web forms applications, then you don’t need to repeat it again when working with asp.net 5. Asp.net web forms are now not included in asp.net 5 components. Visual studio is left behind as asp.net 5 only supports C#. Many good automatic converters are available to switch from VB to C#- you can use them if you have build mvc apps in visual basic. View components are alike when compared to subcontrollers. However, subcontrollers only pretend to be controller actions whereas view components seem more natural. Asp.net 5 version has replaced subcontrollers with View components. In earlier versions of asp.net mvc, there were many differences between MVC controllers and Web API controllers. Developers were using mvc controller with system.web.mvc.controller and for web api controller, they had web.http.apicontroller base class. The latest mvc 6 version has only one controller class – Microsoft.asp.net.mvc.controller that works as a base class for both web API and mvc controllers. This is a popular client side framework used by developers for building Single Page Applications. Developer can minify and combine all of the files of AngularJS automatically while development. 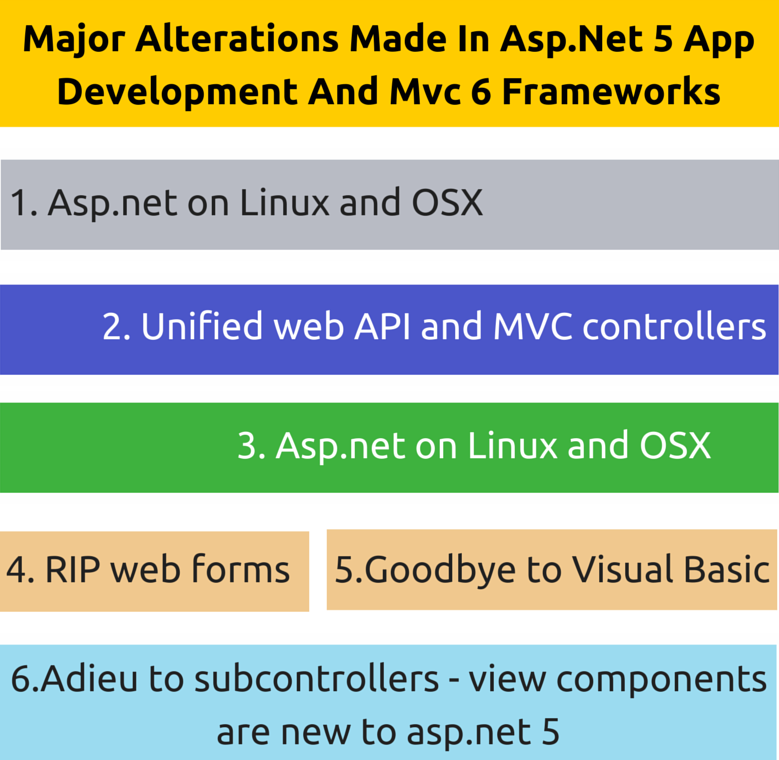 These are few significant alterations made to asp.net 5 and MVC 6 versions. Developers across the globe must know about them to make best practices for asp.net development.